The Best eLearning blogs from thousands of Education and Edu Tech blogs in our index using search and social metrics. We’ve carefully selected these websites because they are actively working to educate, inspire, and empower their readers with frequent updates and high-quality information. Also check out eLearning Podcasts. 2.24 The Rapid E-Learning Blog | Practical, real-world tips for e-learning success. 2.103 Matthew Guyan | eLearning – Learn. Show. Repeat. eLearning newsletter is a comprehensive summary of the day's most important blog posts and news articles from the best eLearning websites on the web, and delivered to your email inbox each morning. To subscribe, simply provide us with your email address. United States About Blog At eLearning Industry you will find the best collection of eLearning articles, eLearning concepts, eLearning software, and eLearning resources. It is the largest online community of elearning professionals in the industry, and was created first and foremost as a knowledge-sharing platform to help elearning professionals and instructional designers connect in a safe online community. Facebook fans 403,178. Twitter followers 138,455. About Blog Coursera has partnered with museums, universities, and other institutions to offer students free classes on an astounding variety of topics. Students can browse the list of available topics or simply answer the question "What would you like to learn about? ", then when they answer that question they are led to a list of available courses on that topic. Facebook fans 1,082,998. Twitter followers 346,073. About Blog Learning Solutions Magazine serves education and training professionals, especially those interested in eLearning and technology. Our goal is to create a place where learning professionals can share their knowledge, expertise, and ideas to build a better industry and better learning experiences for everyone. Facebook fans 4,192. Twitter followers 17,037. USA About Blog At eLearning Infographics you can find the best education infographics based on a thriving community of 75,000 online educators, teachers, instructional designers, professors, and in general, professionals that have a great passion about education. Facebook fans 55,962. Twitter followers 60,278. USA About Blog The eLearning Guild is a community of practice for designers, developers, and managers of eLearning. Our goal is to create a place where eLearning professionals can share their knowledge, expertise, and ideas to build a better industry and better learning experiences for everyon. Facebook fans 9,546. Twitter followers 38,386. Carpinteria, CA About Blog Lynda.com is a leading online learning platform that helps anyone learn business, software, technology and creative skills to achieve personal and professional goals. Facebook fans n/a. Twitter followers 100,138. World Wide About Blog A free community for sharing instructional videos and content for teachers and students. We are an education focused, safe venue for teachers, schools, and home learners. Facebook fans 244,221. Twitter followers 44,441. About Blog This subreddit is dedicated to discussion of the techniques, difficulties and joys of creating, applying and evaluating elearning of all types. Facebook fans 1,214,318. Twitter followers 30,227. Mountain View, CA About Blog Comprehensive up-to-date coverage for e learning, aggregated from news sources all over the world by Google News. Facebook fans 22,607,836. Twitter followers 212,968. Facebook fans 3,748. Twitter followers 4,447. About Blog This Blog is an learning platform that helps you learn almost any language through play. We want to make learning as easy and fun as it can be, using the best technology and science around. We want to take learning out of the classroom and turn it into play. Facebook fans 656,513. Twitter followers 33,536. Anywhere About Blog Pluralsight is the largest online tech and creative training library on the planet! Our mission is to publish high quality, relevant, and timely online training courses for serious developers, IT and creative pros. Every day. Facebook fans 1,326,813. Twitter followers 225,799. About Blog FutureLearn partners with leading universities and specialist organisations around the world to offer a diverse selection of free online courses to anyone, anywhere. Our aim is to connect learners from all over the globe with high quality educators and with each other. Facebook fans 195,381. Twitter followers 65,875. Boston, MA About Blog Site offering high quality educational online courses and learning content to replace textbooks. ur goal is to mature young adults in Christ as the foundation for marriage and family while providing an inspiring and refreshingly real online community in which to share the journey. Facebook fans 8,610. Twitter followers 5,844. New York, NY About Blog The top experts and the world's best teachers. Big Think invites experts who are at the top of their fields or who are disrupting their fields to share the ideas that everyone needs to know. Students can make great use of this website by creating their own distinct ideology, as it provide various opinions on one subject. Moreover, students can get views from experts as well. Facebook fans 2,942,068. Twitter followers 130,937. Mountain View, CA About Blog The best free cultural & educational media on the web. Open Culture provides the best FREE cultural & educational media on the web. Free online courses, audio books, movies, language lessons, and ebooks. Facebook fans 558,822. Twitter followers 343,069. About Blog Adobe's elearning community is the new hub for all industry leading elearning creators. Know the latest in elearning industry, get free trials and join webinars. Facebook fans 48,936. Twitter followers 8,056. About Blog Ted-Ed is full of educational videos on a variety of general education topics that can be accessed for free. Not only are there motivational speakers on Ted, there are also topical videos, often less than ten minutes each that are full of important information. TED-Ed's mission is to capture and amplify the voices of great educators around the world. Facebook fans 3,324,558. Twitter followers 391,010. Vancouver, B.C. About Blog The K5 Learning Blog urges parents to be pro-active in helping their children reach their full academic potential. K5 Learning provides an online reading and math program for kindergarten to grade 5 students. Facebook fans 3,274. Twitter followers 539. San Francisco, CA About Blog Udemy is a global marketplace for learning and teaching online. Master new skills and achieve goals on Udemy and discover stories of Udemy students and instructors, career opportunities, and company news and events. Facebook fans 2,073,167. Twitter followers 123,809. Mountain View, CA About Blog Khan Academy doesn't get top billing due to its popularity. Sal Khan and his team have earned their place by creating self-paced, free, source of online education that has become an industry standard. Khan academy provides an easy path for students to jump in and begin learning about any subject that they choose. Facebook fans 1,332,357. Twitter followers 556,857. Cambridge, MA About Blog Get the latest news, articles and information about MOOCs on edX. Learn about exciting new online courses from the top universities worldwide. Facebook fans 903,842. Twitter followers 227,037. London About Blog World’s most active online community for learning languages! It helps you learn languages in a fun online community with native speakers around the world. Subscribe to get regular updates on language learning, cultural facts, company, product news and more. Facebook fans 1,901,011. Twitter followers 2,043. 24. The Rapid E-Learning Blog | Practical, real-world tips for e-learning success. WA About Blog The Rapid E-Learning Blog shares practical tips & tricks to help you become a rapid e learning pro.It is hosted by Tom Kuhlmann who has over 20 years of hands-on experience in the training industry and currently runs the community at Articulate. Facebook fans 11,022. Twitter followers 20,270. Boston, MA About Blog Provides an interactive online learning environment to learn about data science and various Data analytic tools like Python, R, SQL, Spark, Machine Learning and more. Facebook fans 2,887. Twitter followers 2,094. San Francisco, CA About Blog Top eLearning blog by TalentLMS with articles about Instructional Design and Development, Online Courses, Gamification, Tin Can API, SCORM, mLearning. Facebook fans 8,138. Twitter followers 8,740. San Francisco, California About Blog Welcome to the NEO Blog, the place where we jibber and jabber everything about educational technology, e-learning, and 21st century learning in schools. Its mission is to make teaching and learning more enjoyable and productive by offering an e-learning solution that engages students and makes the whole process more effective. Facebook fans 169. Twitter followers 8,981. Auckland, New Zealand About Blog Replicate real-life with simulation and scenario-based eLearning. SimTutor is the fast and easy way to create powerful workplace training that truly delivers. We've created a cloud based software platform that delivers a fully interactive learning experience so your people can practice without risk, pressure or negative consequences. We call it learning by doing, or Cognitive Simulation in academic-speak. India About Blog Online educational website offering study material and tutorials for CBSE, ICSE, NCERT, SAT, TOEFL and many more. Extramarks Education aims to provide new age digital education solutions that Brings the best of global technology to provide an engaging, child-centric teaching-learning environment in the classroom and at home. Facebook fans 89,414. Twitter followers 2,553. About Blog We are an IT outsourcing company that provides elearning and ecommerce IT solutions. Facebook fans 4. Twitter followers 5. Saratoga Springs, Utah About Blog Check out our resources for eLearning graphic design to learn all of the latest and greatest trends to help you work your eLearning magic. Facebook fans 4,733. Twitter followers 13,326. Dublin, Ireland About Blog LearnUpon's eLearning blog brings you helpful and informative content on the eLearning industry as well as all of the latest company news. Facebook fans 130. Twitter followers 1,434. About Blog Learn a new language for free with Mondly, the award-winning language learning app loved by millions of people worldwide. Learn languages online in just 5 minutes per day! Facebook fans 190,752. Twitter followers 1,046. About Blog Best articles on e-learning, social learning, informal learning, L&D, SCORM, Tin Can, Talent development, Performance Support by Docebo. Docebo Learning Management System is the best cloud LMS system on the market for online training. Facebook fans 32,236. Twitter followers 5,393. About Blog eduCBA Provides online training and video courses on topics like Finance, Mobile Apps, Data Analytics, Project Management and much more. Our aim through educba blog is to connect you with professional tips and ideas that will help you understand work better. We want you to become awesome. Facebook fans 79,375. Twitter followers 777. About Blog Speexx is a leading provider of award-winning online language training solutions for large organizations worldwide. Innovation is at the heart of everything we do. And this is what we like to share on the Speexx Exchange Blog - fresh insights and practical tips on learning technology, talent management and business communication skills. Facebook fans 1,675. Twitter followers 1,383. About Blog SimTek is a fastest growing software solutions company that offers best-in-class business solutions and services in E-learning & Web Development needs. Facebook fans 131. Twitter followers 310. Hyderabad, Telangana, India About Blog The CommLab India eLearning Blog is about the latest and most talked about topics under Corporate Training, Performance and Learning Technology. Facebook fans 1,602. Twitter followers 5,845. About Blog eFront's LMS blog helps you have a successful eLearning experience, providing the necessary eLearning resources. Facebook fans 8,409. Twitter followers 12,706. San Francisco About Blog Welcome to the MATRIX Blog, the place where you will find all sorts of useful information about online training, e-learning, corporate learning management systems and everything in between. its mission is to make training and learning more enjoyable and productive by offering an e-learning solution that engages students and makes the whole process more effective. Facebook fans 19,383. Twitter followers 11,055. Everywhere! About Blog Discover SHIFT, the most disruptive eLearning development tool, designed to meet all your eLearning, mLearningneeds in one place! Facebook fans 1,318. Twitter followers 4,428. San Jose, CA About Blog Vagupu is an online tutoring marketplace that connects tutors and learners in real time with integrated collaboration tools and payment infrastructure. Facebook fans 3,285. Twitter followers 573. Global About Blog The latest news, insights and elearning tool reviews from Kineo. Our learning technologies blog is constantly updated with the latest elearning news, authoring tool reviews, Totara LMS trends and Adapt Learning updates. Facebook fans 895. Twitter followers 7,660. Tampa, FL About Blog eLogic Learning helps businesses achieve results with learning solutions including the eSSential Learning Management System (LMS) and eLearning development. Facebook fans 358. Twitter followers 1,164. DC Region About Blog Welcome to readers around the planet! This is the website of Connie Malamed, an eLearning, information and visual designer. The eLearning Coach - For designing smarter learning experiences. Facebook fans 3,217. Twitter followers 10,595. Portland, Oregon About Blog OpenSesame, the trusted provider of on-demand elearning courses for the enterprise. OpenSesame makes buying and selling elearning courses as easy as downloading a song from iTunes. Preview courses, read reviews and research sellers in our marketplace. Facebook fans 5,191. Twitter followers 5,609. Corsham, Wiltshire, England About Blog Learning in the Social Workplace, by Jane Hart, Independent advisor on Workplace Learning & Collaboration. At Jane’s blog you will find how to support learning, performance and collaboration in the social workplace. Facebook fans 8,458. Twitter followers 31,445. About Blog Welcome to the Everything eLearning Blog! Discover tips and industry news on eLearning design and development, mobile learning, and rapid eLearning. Facebook fans 2,336. Twitter followers 4,224. Brighton, UK About Blog Elucidat provides tips to improve elearning performance. Their mission is to be the fastest and simplest way for teams to design unique, engaging content. Subscribe to get the latest updates from this blog. Facebook fans 346. Twitter followers 9,476. Vancouver, BC, Canada About Blog The Lambda Solutions eLearning blog covers industry highlights in eLearning, best practices in Talent Management and Learning Management, and Trends in Learning and Online Training. Facebook fans 275. Twitter followers 1,723. About Blog Welcome to IconLogic's Blog! This is where we share insight on Camtasia, PowerPoint, eLearning & mLearning, social media, and Adobe’s Captivate, FrameMaker, RoboHelp & Acrobat. Facebook fans 487. Twitter followers 115. Facebook fans 1,222. Twitter followers 2,153. India About Blog Known as the online school of analytics. Aims at teaching everything about Big Data and Data analytics. Facebook fans 67,888. Twitter followers 1,195. India About Blog A leading provider of learning solutions and services to organizations worldwide. Our mission is to be a leading provider of effective eLearning Solutions to the global community. Facebook fans 1,939. Twitter followers 12,562. Facebook fans 152. Twitter followers 557. Boston About Blog The Thought Industries Blog provides B2B and B2C content, news, tricks, information and tips about online learning. Facebook fans 103. Twitter followers 1,162. St. Paul, MN About Blog Allen Interactions, Inc., is an internationally acclaimed custom learning design, development, strategic consulting, and technology firm. blog features Allen Interactions staff members including Instructional Designers, Strategists, etc., as well as guest blogs from leaders in the industry to provide readers with engaging and meaningful content. Facebook fans 811. Twitter followers 5,275. Bengaluru, India About Blog EIDesign is a top bespoke elearning & blended learning development company in India that provides innovative learning solutions to businesses worldwide. Facebook fans 507. Twitter followers 647. Minneapolis, MN About Blog Custom learning solutions, elearning, performance support & change management improve performance & drive business results. See how we make learning happen. Learn about the latest trends and insights in the learning and development field from industry thought leaders. Facebook fans 196. Twitter followers 755. United States About Blog e-Learning Tags is a social bookmarking service where you can discover, share, vote and discuss remarkable eLearning content. Facebook fans 5,535. Twitter followers 33,732. About Blog Visit JoomlaLMS eLearning Blog to learn what is LMS and how to effective use it in eLearning practice. Get useful JoomlaLMS tips and tricks. Facebook fans 1,042. Twitter followers 1,963. Los Angeles About Blog Blogger Craig Weiss was named 2015’s most influential person in the eLearning industry. He is an expert on Learning Management Systems and a well-known public speaker. Facebook fans n/a. Twitter followers 7,565. New York, USA About Blog Ed's Mobile Learning Blog covers microlearning, learning management systems, mobile LMS, eLearning plus corporate, retail & organisational training. Facebook fans 2. Twitter followers 1,936. Seattle About Blog Our e-Learning Blog includes free eLearning template downloads, job aids, tips and tricks for instructional designers and other eLearning professionals. Facebook fans 102. Twitter followers 2,134. New York City About Blog ELM's Learning Lab is an eLearning blog offering thought leadership on the latest news and ideas in the learning world. Facebook fans 664. Twitter followers 1,352. Brighton About Blog Read the latest elearning insights and elearning blog posts from gomo learning. Expect learning design, cloud authoring and multi-device learning insights! Facebook fans n/a. Twitter followers 4,055. Cleveland, Ohio About Blog Cinecraft is an award-winning Cleveland-based video production, eLearning, mLearning and gamification company. It provides Video Production News. Latest awards and announcements in custom eLearning. Facebook fans 385. Twitter followers 883. Pennsylvania, USA About Blog Talented Learning is an independent research and consulting firm devoted to helping organizations of all sizes choose and use the best LMS and related technologies for their unique business needs. Facebook fans 236. Twitter followers 5,372. East Midlands, UK About Blog A blog by David Hopkins. I started this blog to order and publish my thoughts, and to engage with educators, facilitators, technicians, designers, etc who are interested in the same kind of things, namely eLearning, mLearning, Blackbaord / VLE / CMS, simulation-based learning, technology in the classroom, Web 2.0, Augmented Reality, QR Codes, etc. Facebook fans n/a. Twitter followers 9,051. USA About Blog At VivaeLearning you will find the Best Collection of Free Videos Tutorials Online about eLearning Software, Learning Management Systems, eLearning Authoring Tools, and Educational Technologies. Facebook fans 2,184. Twitter followers 10,441. Bellevue, WA About Blog Redefine the training experience with our LMS service, designed to drive performance and develop leaders. Transform the way you manage learning with Knowledge Anywhere. Facebook fans 149. Twitter followers 1,343. Austin, TX About Blog Staying at the top of the industry requires knowledge, and we’re always learning. Read our latest knowledge on our blog. Facebook fans 549. Twitter followers 1,010. India About Blog eNyota Learning is a leading eLearning company providing custom/bespoke learning solutions to organizations worldwide. Read our best eLearning industry blogs for valuable content in eLearning & mLearning. Know about latest trends, the most recognized thoughts, technologies and other happenings. Facebook fans 2,398. Twitter followers 758. Shoreham, England About Blog On the Me Learning blog we share news of our latest safeguarding and educational e-learning courses to help train and support anyone in the UK who works with children, young people or vulnerable adults. Facebook fans 564. Twitter followers 400. About Blog The Coursepath blog informs about news and trends in the area of online training: events, customers, product features and corporate learning best practice. Facebook fans 32. Twitter followers 700. Orlando, Florida About Blog The Riptide Learning Blog, Get the most from your talent development efforts with educational resources. Riptide provides high quality, scaleable solutions to customers across the country. The company has a proven track record for developing and deploying four systems with multi-million lines of code. Riptide is committed to the success of its customers no matter what the industry or the need. Facebook fans 185. Twitter followers 216. USA | INDIA About Blog Origin has served leading brands in high-tech, engineering and manufacturing domain, supporting them in achieving their learning goals for over seven years now. Origin Learning delivers impactful eLearning with the perfect blend of instructional design, graphic design, programming, and innovative technology solutions. Facebook fans 5,930. Twitter followers 1,695. India About Blog Swift Elearning Services a top elearning provider company in India, offers custom elearning and software solutions to global USA, Australia, European, Gulf. Get the latest technology news on top elearning trends, rapid elearning development, Custom courseware, download elearning freebies and elearning resources case. Facebook fans 312. Twitter followers 1,477. About Blog Tips to help you launch your online courses, create a course site, build high converting sales funnels and ultimately grow your business. Learn how to choose the right course platform, create a course website, build a sales funnel and market your online courses. Edmonton, AB About Blog Learning Management System (LMS). Support all Types of Learning and Evaluations, Not Just eLearning, TinCan & SCORM Compliant. eCommerce. Employee Training. Provide best-in-class custom learning solutions that enable people to increase their value within their organization through competency. Facebook fans 179. Twitter followers 666. London, Malta About Blog Skillcast helps companies to build integrity and ethics and manage their regulatory compliance risk. Find Best practice and latest trends in regulatory compliance training, digital learning, EdTech and RegTech. Facebook fans 4,199. Twitter followers 1,938. Bengaluru, India About Blog Tesseract Learning is a bespoke eLearning development company based in India providing custom eLearning, Mobile learning, Microlearning, responsive course development, Game Based eLearning, Gamification, Flash to HTML5 migration, HTML5, Mobile apps, Localization and Moodle LMS to global customers. Facebook fans 178. Twitter followers 449. Ireland and beyond About Blog We freely share our knowledge through our blog. We constantly update it with tips, how-to guides, examples and the latest thinking on learning technology and digital learning. Facebook fans 233. Twitter followers 17,710. Sydney About Blog E-Learning Provocateur is the brainchild of Ryan Tracey, a member of eLearn Magazine’s editorial board. Tracey hopes to “provoke deeper thinking” in the world of eLearning. Facebook fans n/a. Twitter followers 9,388. About Blog Distance-Educator.com is the pioneer portal for professionals in the field of distance education and elearning since 1995. Facebook fans 407. Twitter followers 858. London, England About Blog Articles and tips from thought-leaders on instructional design, blended programmes, bespoke elearning development and UX design. Helping you connect with your learners and boost your learning strategy. Facebook fans 91. Twitter followers 7,714. Charlottesville, VA About Blog Scitent's eLearning Blog Featuring Technology and Services trends - Take instructional content online to meet the needs of learners. Facebook fans 1,399. Twitter followers 697. Rotterdam, Netherlands About Blog My journey through the world of e-Learning and knowledge sharing. This blog contains my personal views but is also written from my perspective as CEO of Easygenerator. Facebook fans 271. Twitter followers 1,042. Facebook fans 1,446. Twitter followers 1,441. About Blog Knowzies Blog is a sincere attempt to keep all our readers updated about the latest trends in eLearning and mLearning and also seeking their views on the same. We at Knowzies believe in continuous innovations and delighting our esteem followers/readers with newest of the information. Facebook fans 7. Twitter followers 85. India About Blog Wordsandvideos offers online language learning classes in vertual classroom environment. WAV has Extensive list of foreign/Indian language courses offered. Facebook fans 106. Twitter followers 6. Denver, CO About Blog eLearning Elevated provides solutions for training, course design, development and educational consulting. As educational professionals with advanced degrees and years of experience, we create awesome online content and courses. We make your content easy for others to learn. Facebook fans 113. Twitter followers 115. Denmark About Blog News about flexible, netbased learning and teaching, e-learning, blended learning, distance learning, m-learning, math and statistics. Facebook fans 129. Twitter followers 656. Australia About Blog News, insights and resources about eLearning, digital education and training. Facebook fans 687. Twitter followers 2,262. Dublin | Ireland About Blog Michael Hanley's blog about e-learning, web-based elearning, technology in education, e-learning tools, learning 2.0 (blogs and podcasts), & continuous professional development. About Blog I have been developing online education programs since 1995. I believe in the power of online education. But there are a lot of different models of online education and not all of them work. You'll get a sense of what I believe in and believe is important as you read this blog. Latrobe, PA About Blog This website is the culmination of an idea that I have had for the last several years. It serves primarily as a portfolio for my work, but it is also a place to openly collaborate with my colleagues in the Instructional Design and eLearning industry. Facebook fans n/a. Twitter followers 424. Louisville, KY About Blog ElearningInside News brings you vetted, well sourced and investigated news stories to the e-Learning community. We aspire to reporting relevant, timely and insightful news stories, profiles and solutions to help educate our readers. About Blog The destination for news, blogs and Post on onlline learning. Facebook fans 9,323,378. Twitter followers 9,823,576. Dublin, CA About Blog Whether you are training employees, customers or channel partners, Litmos has an award winning learning management system all learners will enjoy. Facebook fans 13,169. Twitter followers 9,760. 103. Matthew Guyan | eLearning – Learn. Show. Repeat. Newcastle, NSW, Australia About Blog A site all about what I'm learning about eLearning and showing samples of work and useful resources for eLearning pros. Facebook fans n/a. Twitter followers 3,059. About Blog It’s a channel which provides the educational based tutorial videos that helps to get academicals knowledge by E learning. About Blog Oxford Online English is an online English school offering premium-quality online English lessons to suit your needs. We also make free English lessons every week, and you can see our free English video lessons here. Check out our site to see more of our free English lessons or to find out more about our online English classes. Facebook fans 55,948. Twitter followers n/a. Europe About Blog Cathy Moore is an impassioned advocate for interesting and stimulating eLearning. Cathy provides Ideas for lively learning design and tips on how to use action mapping, an instructional design model that makes it easy to create concise, challenging training. Facebook fans n/a. Twitter followers 11,567. Pune, India About Blog UpsideLMS is a winner of 20 industry awards and recognitions with a comprehensive feature set that helps you maximize the impact of your learning programs. Its configurable architecture makes this cloud-based, SaaS LMS the perfect fit for SMBs, Enterprises and Training Companies. Facebook fans 157. Twitter followers 312. New York, NY About Blog Codecademy works because it makes coding accessible to any interested student, provides practical recommendations for students who want to learn how to code but don't understand how these new skill might apply to their current job. Facebook fans 513,685. Twitter followers 413,722. UK About Blog A summary of the most modern e-learning development techniques available including 3D e-learning, virtual learning worlds, cloud based authoring and comedy e-learning. India About Blog provides a large number of certification courses like CFP, CFA, CIMA, NSE certified Business Analytics course and many more. Facebook fans 20,626. Twitter followers 139. About Blog A language learning website offering a fun and addictive way to learn new languages like French, Spanish, German, Italian, Dutch and many more. They provide lessons on 23 different languages. Facebook fans 1,234,392. Twitter followers 230,279. Berlin & New York About Blog Everything you need to know about online language learning, our latest courses and products, and what's happening. Facebook fans 451,973. Twitter followers 24,781. Greater Boston Area (US) About Blog Cammy is the VP of Learning Design for Kineo and blogging about e-learning and instructional design since 2005. Facebook fans n/a. Twitter followers 10,742. Lehi, Utah About Blog Learning Dojo is focused on providing training, tips and tricks and other resources for eLearning developers. Whether it is learning how to use standard eLearning tools like Articulate Storyline, Adobe Captivate or Lectora or learning to build your own custom HTML interactions Learning Dojo will help you get there. About Blog O4Learn (Online for Learning) is platform for social learning. We care about people who want to learn online. We want them to have the best experience learning something new. Facebook fans 632. Twitter followers 13. About Blog The e-Learning Academy is established with the specific mandate to drive and support the implementation of blended learning at Taylor's University Lakeside Campus. The name 'academy' reflects its core purpose as unit which primarily promotes 'learning how to teach with technology'. Hence, eLA's task is to help our lecturers effectively implement the use of technology into teaching and learning. Facebook fans 321. Twitter followers n/a. About Blog A blog on e- learning by Doha Dakik. 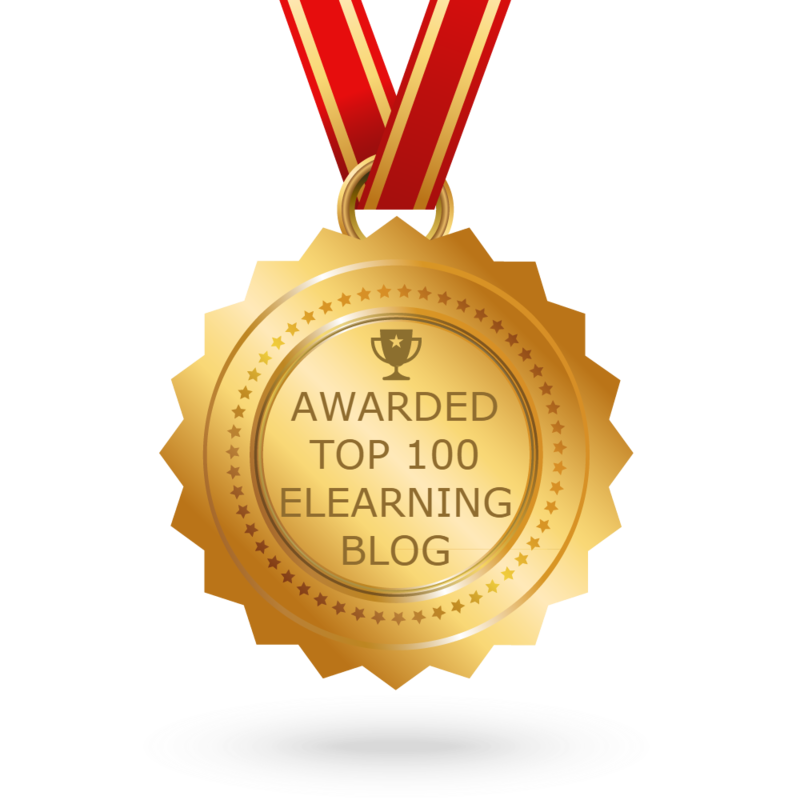 CONGRATULATIONS to every blogger that has made this Top eLearning Blogs list! This is the most comprehensive list of best eLearning blogs on the internet and I’m honoured to have you as part of this! I personally give you a high-five and want to thank you for your contribution to this world.